Coolquip Range of Vortex Tubes: Vortex Tube, Cabinet Cooler, Panel Cooling Unit - Controllers for Air Conditioning and Refrigeration, GSM Temperature Monitoring, Vortex Tubes for Panel Cooling. Controllers for Air Conditioning and Refrigeration, GSM Temperature Monitoring, Vortex Tubes for Panel Cooling. Compressed air is fed into the Vortex tube. Inside the tube the compressed air is seperated into hot and cold streams, and hot air is then expelled from the exhaust end and cold air from the other side. 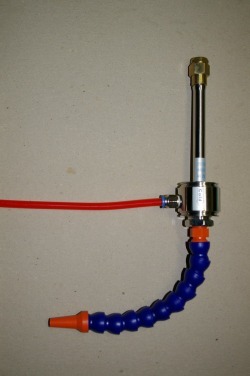 The Vortex Tube is ideal for panel cooling, especially in applications where compressed air is already present. The product is also ideal for manufacturing processes. Capacities of up to 2500 BTU are available. Vortex Tubes are low-maintenance devices as there are no moving parts. The only requirement is a clean regulated supply of compressed air.